Ideal for use for Hands Free Access Control, Key Tracking and Vehicle Identification in new and used car lots and vehicle supply chain. The Protrac iD series of Active Tags are powered by an internal lithium battery. The tag will, for the duration of its life, transmit a Radio Frequency signal at a pre-set time interval. The tag life is estimated at up to 5 years at a transmission time interval of approximately 1.5 seconds. The lifespan of the Tag ends when the battery life is exhausted. The transmitted tag data includes Customer Site Code, Tag ID and Tag Age Counter Value. For protection against adverse environmental conditions, Protrac iD Pendant Tags are encapsulated in a molded plastic case ultrasonically sealed during the manufacturing process. The 2T8900 tag is ideal for use for Hands-Free Access Control, Key Tracking and Vehicle Identification in new and used car lots and vehicle supply chain. 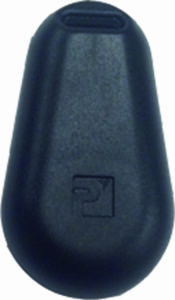 The 2T8900 is ideally worn on a key fob or lanyard.